Ted Vining writes: "These are a few of Our Favourite Things – making good music, good food, good wines, a shot of Jack Daniels, and nice enthusiastic audiences. "We experienced this and more on a recent tour through Melbourne at The Horn, the Jazz Basement in Wodonga, The Gods Café in Canberra, the Whale Motor Inn in Narooma, the Down South Jazz Club in Merimbula, the Wine Bar in Paynesville, back to Melbourne’s Uptown Jazz Café, winding up with this recording session at Move Studios. "Special thanks to Bob and Gareth for their wonderful musicality and ridiculous sense of humour. 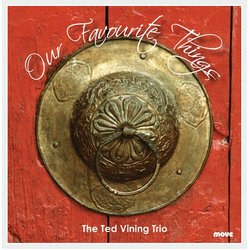 We hope this CD becomes one of your favourite things."